This was simply one of the very best shows I've ever seen. This was my first concert since about 1989, and my first time at the Uptown since Todd Rundgren's Acapella tour in the mid-80s. 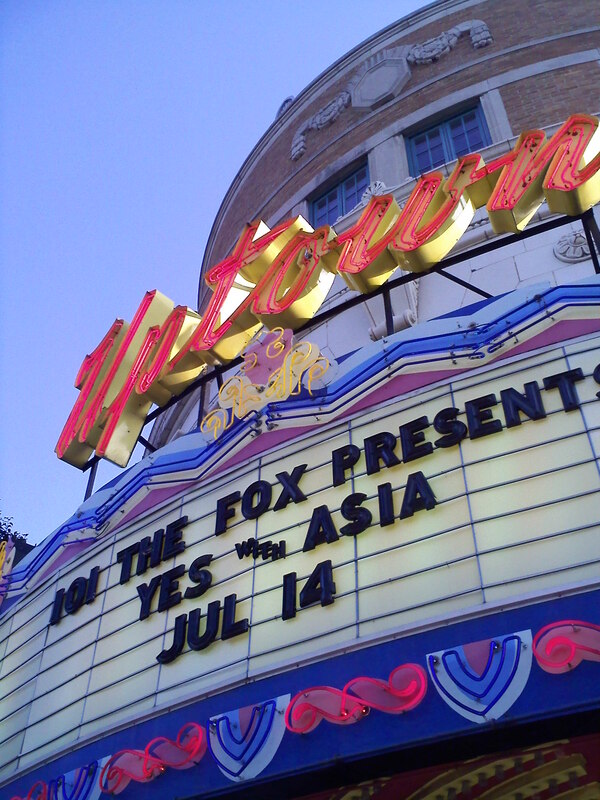 This was also my first time seeing Asia, and only the third time seeing Yes (though I've had tickets 3 other times, all 3 concerts canceled). First off, the Uptown Theater is a beautiful place, but the acoustics aren't very good, and it was hot. Very hot. The performers (and audience members) were drenched with sweat. A number of synths on stage during both sets died from the heat, even with fans aimed directly into them. And vocals often got lost in the mix due to the acoustics, although the volume was quite loud. Asia was incredible. No other way to put it. I've never been to a concert where the vast majority of the audience was disappointed that they didn't do an encore. All 4 members of Asia were incredible. They did all their major hits, and each member performed a "solo" piece, from a previous band. 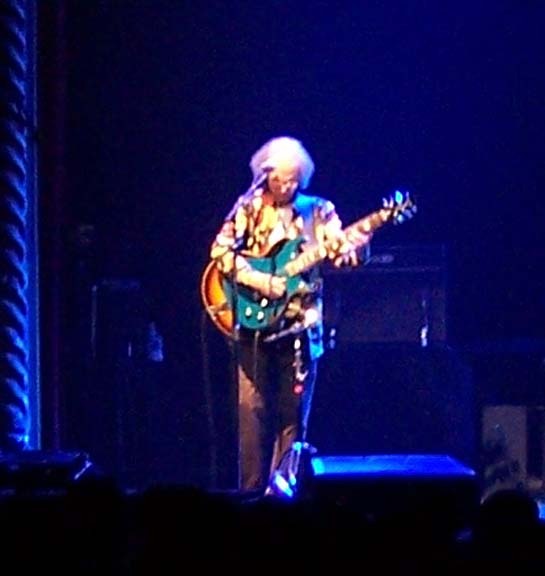 On Video Killed the Radio Star, Steve Howe, 5 time winner of Guitar Player Magazines "Best All-Around Guitarist," looked like he was having a blast! But the real jewels were "Fanfare For the Common Man" (and Carl Palmer's drum solo, AMAZING - reminded me of Stuart Copeland's self description of the "gorilla school of drumming" - wow he was LOUD! ), and incredible performance, but "Court of the Crimson King" was electrifying! I think the entire venue went up when that song began! Just an incredible set, and as I said, they left the audience wanting MORE! Then Yes... What can I say? They are masters of what they do. Chris stated that "with the loss of James Brown, Steve Howe is now the hardest working man in show business!" And I think that Chris was right! Steve didn't perform like a 62 year old performer! He was energized on stage, and even had some fun with the audience. Alan was a rock behind the drums. Oliver was awesome. Unfortunately, no solo, however a good way to judge a Yes keyboardist is the organ bit about 2/3 of the way through "Roundabout." He hit the "urgency" of the piece just wonderfully. Chris? What can you say about one of the greatest and most creative bass players in modern music? He rocked the house. And had some really great moments with the audience. Benoit David? I thought he was terrific! The entire band looked as though they were having a great time, and they were loose and relaxed on stage. There were some moments... Steve jumping around on stage, doing his "Rock Star" bit, having fun. Steve doing a "settle down" bit for over-enthusiastic fans during his acoustic pieces (both with Asia & Yes). But the best was when the special effects got a bit out of hand. It was hot. Remember? Well, Chris had this little fan on the stage blowing air up to try to keep him cool. What it did was blast a stream of fog directly into his face, and he & the rest of the band cracked up, though they didn't miss a beat. One last thing... When the band began playing "Owner of a Lonely Heart," Benoit came out on stage with a cowbell, and I'm afraid the only thing I could think of during that entire song was "MORE COWBELL!" Yes and Asia simply blew away the Burgh! I saw this show in Hershey Pa last November. Yes was good, as usual, but not their incredible selves. This show, however was simply incredible. Preface...I am a HUGE Jon Anderson fan, and also Rick Wakeman....neither of which were performing. Yes last night was simply awesome. 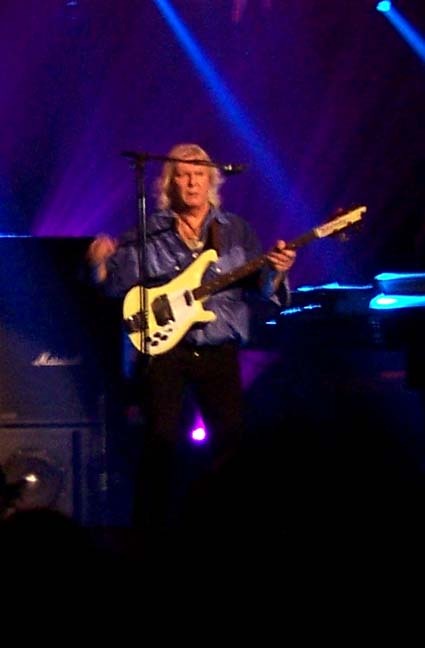 Chris Squire was extremely good, I sat about 8 rows directly in front of him and Oliver Wakeman. Chris seemed genuinely happy to be there, and the band looked as if they were really enjoying their performance. The music set was excellent- I missed Close to the Edge-and played flawlessly. Oliver Wakeman is a wonderful new talent, he played his fathers music without missing a note. A real joy to know that Oliver will take Yes music to the next level, and still keep the original musician his father is "out there". Benoit David was much better, keeping Jon's vocal styles part of the mix. Benoit is absolutely not the showman Jon is- but his voice sounded like Jon's did in the 70's. Loved hearing Your Move again...Steve Howe is just amazing. Why he is not known and held in the same acclaim as Eric Clapton and Eddie Van Halen is simply a puzzle. Steve is just so versatile, and technically excellent. He went from Rock, to Classical, Jazz, and Country in one sitting. All perfect. Alan is solid, like always. He's not 25 anymore, but he was also great. He is not the Alan of 1974....but who is? Many drummers of his age use a shadow drummer to carry the load (Moody Blues, and others). Alan faithfully reproduces the complex music flawlessly. A true professional in every regard. Asia was an incredibly wonderful surprise- so good that Pittsburgh did not want them to stop- even though they wanted to see Yes so very much as well. Carl Palmer is simply amazing. I had not seen him perform since 1976, with ELP. He may be better now. He certainly has a strong stage presence. Whetton was unbelievably superb, as was Downes. The new song they performed was excellent as well. Some of the reviews I've read have been mixed, at best. Both bands seemed genuinely happy to be there- spoke to the rather large audience- much larger than normal at this Venue- and the crowd around me simply loved all they saw and heard. still amazes me after all these years. i"ve seen YES about 15 times. they"ve only come to winnipg once so i travelled 800 miles by car to see them for the second time on this tour in kansas. i saw their first show in hamilton , ontario last november. i few 1400 to see them . what a show they put on then and what a fantastic show they did again in kansas. the setlist was great . nice to hear "machine messiah" and "tempus fugit" from drama. finally we get to hear these songs -especially the former for me. with newcomers benoit david & oliver wakeman yes hasn"t missed a beat. chris -you were fantastic as always. to me you are so enthused like it was your first tour. steve how was amazing jumping back & forth from guitars after he played w/ asia. and alan was his usual rock steady self. great set list guys . astra traveller was a gem to hear. also it was great that you closed w/ " starship trooper" like the old tours. i"ve seen YES about 15 time or so& always have to trvel 450 miles to minneapolis /or 800 miles to kansas city. hell i even went to the "union tour" in 91 in orlando , florada. your music always inspires me and i never , ever get tired of it. i ca"t believe how much benoit david sounds like jon -truly amazing . and i think he is getting better w/ each show. oliver , well what can you say -who did he have for a teacher. yes had a bright future ahead thats for sure. any chance chris of a new song on the tour? , or a new cd .that would be great. i was sitting in row 2 and in front of me were 4 empty seats. a guy came from behind the cutain & sat down in front of me. i knew it was benoit david. i asked him for his autograph and he was kind enough to give it to me. what a great momento. asia was very impressive.loved them as i"ve never seen them before.i look forward to many more years of fantastic YES music whatever the lineup is. steve -you didn"t look tired at all after playing w/ asia. YES -yes still has that magic and can hardly wait to see you guys again. Remember that America was quite forgiving when Squire, Howe and White launched the Buggles-Yes band. Also, that band was premiering new quality songs tailored by the artists. What happened when they went to Europe? The British fans would have nothing to do with Trevor Horn even with a magnificent new product. Now we have a tribute band's vocalist prancing joyously and totally clueless that he cannot convey what he cannot conceive, namely the content expressed in Anderson's mystical essays. They have no new artistic achievement to reveal. Do you think that European fans will accept this any better than in 1980? I suspect the Fall European will Yes' swan song. I wish them well as they sail away. I was anxious about this incarnation of YES but was soon put to rest with the opening "Siberian". When you closed your eyes it was YES music, and as Jon stated earlier, that is what is important. Loved it all even "Owner". I was looking forward to the Drama material and wasn't disappointed, excellent live material. Without a doubt the highlight of the evening was "Heart of the Sunrise." So powerful from Chris's opening riffs to the concluding crescendo it almost brought tears to my eyes. Without hesitation I would see this lineup again. When I was 9 years old in 1983 my brother Casey introduced me to a rock band called Asia. I remember listening to those first two albums every day, after listening to them I would go outside and ride my bike with songs like "Without You" stuck in my head, for some reason Asia's music conjured up visions of Dragons and Knights in my head, maybe it was the serpent on the self titled album or maybe it was because I was starting to discover Dungeons and Dragons. Any way Casey once told me about all of the bands that the guys in Asia came from to form Asia, I remember very specifically him saying Steve Howe and Yes (probably because Yes is an easy band name to remember). At that moment I was a Yes fan. I was 12 when I bought a used copy of Going for the One, Tormato and 90125. Now I'm 35, I have only seen Yes twice in my life and Asia once. I have been waiting 24 years to see the band that opened me up to so many other bands! Asia, Yes, ELP, King Crimson, UK etc. I guess maybe I got a bit off the subject and maybe I am ranting and raving, this is not a "review" it is a thank you to Steve Howe, John Wetton, Geoffry Downs, Carl Palmer, Chris Squire, Alan White, Oliver Wakeman(who from a distance looks a lotlike his dad with the same mannerisms etc.) and last but not least Benoit David. You guys all Rock! God Bless! I have been a Yes fan since the 70's. I have seen a show from all of the various member changes. I don't think I have ever seen a bad show. They always put on a quality show and this was no exception. I like Yes music and I like live music, so I always enjoy the shows. Although I like the classic version of Yes the best (Anderson/Howe/White/Squire/R. Wakeman), if I closed my eyes, I could not tell the difference between them and the lineup last night. It was a quality show. If you truely like Yes music, you will enjoy this concert. Hope some new music comes in the future. I have been a Yesfan since 1974. Seen most every tour they have done since Relayer. I was sitting next to a fellow from Omaha who has been a fan since then, as well. It was fun comparing notes and shows with him, especially since we were apparently at just about every show Yes has played in KC, Omamha, and St. Louis. Was sitting around a lot of kids, which is always nice to see. I have taken my daughter to Yesshows since she was 9. I did want to say to the a$$holes sitting to my right in row CCC to shut the f&^k up. Why would someone pay $175.00 for tix and then talk throughout the music? Mercifully, they left shortly after Yes came on. Anyway, ASIA was superb! I and Mr.Oamha had both been at the Starlight Theater show they played on their first tour on July 4, 1984 at 2:00pm. Blazingly hot! Last night, they nailed everything they did. John Wetton still has it, Geoff Downes was a revelation, Carl Palmer was, well, Carl Palmer. Yes absolutely rocked the house! This was simply one of the best shows I have seen them perfom after 35+ times. I liked Benoit when I saw them in St. Louis last December, but he has grown into his role so much since then. He was having a blast, as were Steve and Chris. I am sure the appreciative KC audience played a part in that. For me, "Machine Messiah" and "Astral Traveler" were the highlights, but the whole show was stupendous. My wife is a marginal fan, but even she proclaimed the show was excellent (Asia and Yes). Putting up with personnel changes has always been part of the Yes experience. 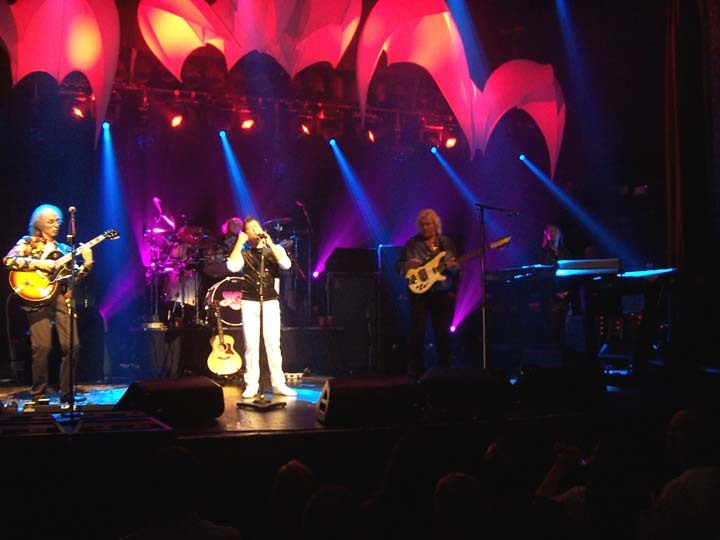 I was reluctant to accept Trevor Rabin, being a huge Howe fan, but the shows he played with them were fun. I loved the "Drama" album, so I figured they could do without Jon...and they did very nicely without him. In my view, Yes is Chris' band, really, and he has always ensured that they field at least an adequate team of players. GO SEE THIS SHOW! Yes is NOT a band, Yes is a thought in the eternal mind of God. To the band, I would say thank you for being the soundtrack of my life. Keep going. People WILL always come to see you. Love you all. I have been a YES fan for the past 28 years and having seen the band on every visit to KC over that span of time, last nights performance was excellent. The musicianship of both ASIA and YES was superb, and the energy level of YES was unlike anything I have ever seen from the band on any tour, old or new. Steve Howe in particular was letting loose and was genuinely enjoying himself jumping around the stage unlike tours of the past standing still. Chris Squire was his usual showman self hamming it up, Alan White was on fire, and the two new comers Benoit David and Oliver Wakeman did a wonderful job filling in for some very big shoes. 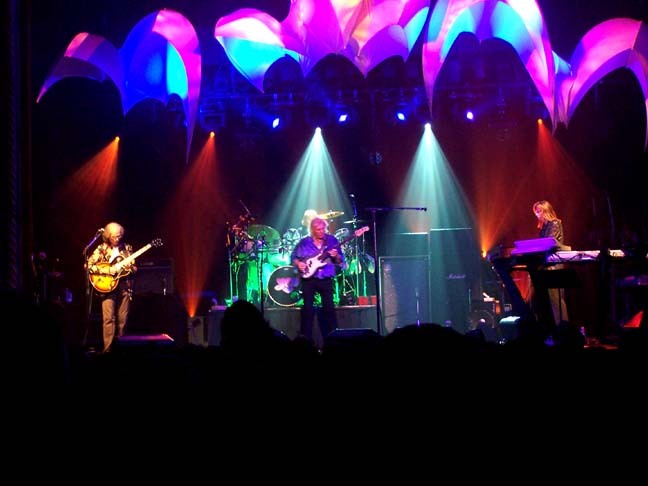 No matter what holds for the future of YES, it was an evening of music not to be missed. This was my first YES show- a magical night that exceeded even my highest expectations! The show started with Asia playing a relatively short but nonetheless energetic and exciting set. The set list was diverse but flowed nicely and the band's energy and enthusiasm made every song great. Asia's performance of In the Court of the Crimson King was spectacular, and Mr. Carl Palmer's solo during Fanfare for the Common Man had every person in the audience grinning. Even after Asia left the stage, the best was still to come. 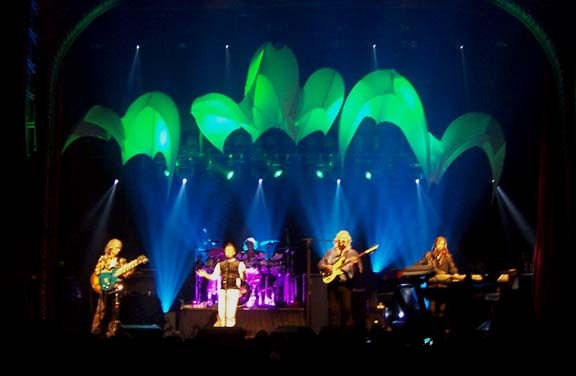 The YES set included a great mix of classic YES concert songs and several songs that are performed live less-frequently. The classics all sounded fresh and exciting- never stale or boring- while the rarer material (such as the songs off the Drama album and Astral Traveler) were wonderful to hear live and extremely well performed. Nothing was out of place. I don't have a single negative comment! I must say that the current line-up seemed to work very well together. I could feel the energy between the band members and their genuine love for the music of YES and for the fans that can appreciate it. Oliver and Benoit fit right in and were very good, and every member of the band seemed to be enjoying himself- hopefully as much as we were! This special night will never be forgotten! We love you so much Steve, Chris, Alan, Oliver, and Benoit! Thank you for a fantastic evening! This was very special... very magical.